Di Luca wants it and wants it BAD. Look at the determination! Looking steep coming out of the curve. Not bad for a 36 year old. Not quite as happy as Simoni. I dont think I have seen a picture yet during the giro where di luca was smiling on the podium. maybe he doesn't like podium girls? Maybe he's afraid that if he gets too happy he will lose it before the race is over. Graham Watson has his moments. Oh, that's a smile all right. Think 'the Mona Luca'. And those are great pics. He only wants to smile on the one podium that counts. The one in Milan. 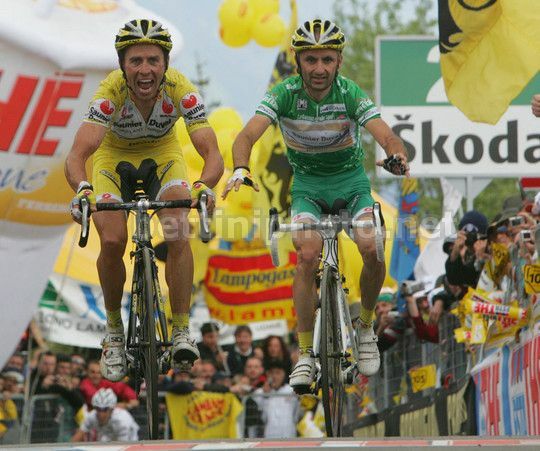 To answer the original question about the team cars on the Zoncolan...it was due to the steepness and the width of the road and if you recall the Angliru climb that Heras won in the Vuelta in 2002, it was raining and the team cars could not get traction on the road and several got stuck. The road on the Zoncolan is so narrow that if that occurred, no one could get around them. There had been a threat of rain and they decided to take the safe route. I can't imagine the fun of flatting on that climb and trying to get started again. On the Angliru, several riders rode it with flats because they could not get service. Last edited by roadwarrior; 06-01-07 at 03:10 AM. Someone on another forum reckons Saunier Duval shorts make the riders look like they are wearing a merkin. congratulations. i just learned something on bf today. doesn't happen very often. You must be a youngster. I am old enough to remember when everyone made fun of President Johnson's frequent line, "My fellow Amerkins." Yeah the black thing in the middle of the shorts is a bad idea. No idea why they did that. It would have looked better as all yellow. Yeah the black thing in the middle of the shorts is a bad idea. No idea why they did that. guess you never saw what they looked like at the end of a wet race, after sitting on a black saddle for hours on end. It would have looked better as all yellow. it was and it didn't. Why does Peipoli look like a candy apple? huge head. RAI had some great side shots of the climb- looked like the villains lairs in the old Batman series. I like the three-wheeled scooters, those things are great, you just step off them and they don't fall down like 2-wheeled scooters. Looks like Peipoli is just learning how to ride with no hands in that one shot.